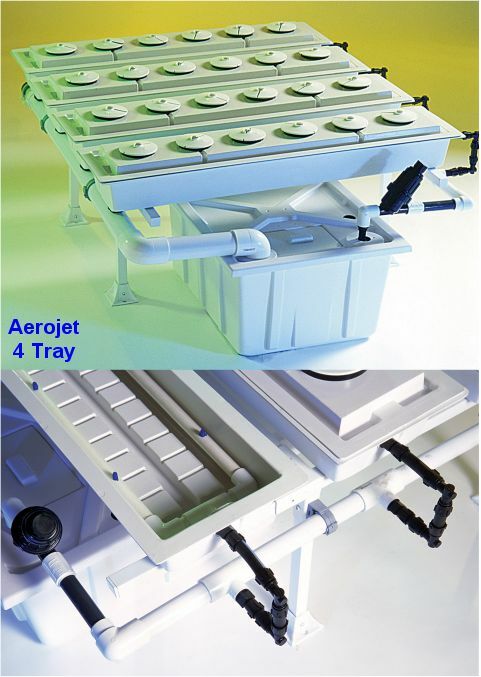 The Aerojet is Botanicare’s Best Selling Expandable Aeroponics Hydrogarden The Aerojet System includes: Heavy Duty Anodized Aluminum Bench, Pump, Reservoir and Trays with Lid, Manifold piping, Sprayers, Rootguards, Netpots. AEROPONIC SYSTEM WITH INTERNALLY FED TRAYS 8” X 42” x 6” GROW TRAYS WITH REMOVEABLE LID Tray includes lid, manifold, sprayers, rootguard, netpots. The Aerojet® is powered by a high output pump providing a super-oxygenated environment to the root system. Mist continually or in micro bursts of one minute on and four minutes off. Aeroponic internal bottom feed w/ removeable lids. Includes Pump and Reservoir. The Aerojet® is a true aeroponic system, or deep flow hydro-aeroponic system. Micro jets spray the roots of the plants allowing for aggressive growth rates from the high levels of oxygen to the root zone. Ideal for schools, research and eduction to monitor the root system. Preferred by advanced growers as the method of choice in feed delivery methods. The Aerojet® is a true tool to teach and learn the science of hydrogardening dynamics. Just search the word ‘Aerojet’ for a listing of all complete Aerojet systems and expansion modules. Reservoir Capacity: 2 Tray Aerojet: 10 gallon 4 Tray Aerojet: 20 gallon 6 Tray Aerojet: 20 gallon 8 Tray Aerojet: 40 gallon 12 Tray Aerojet: 40 gallon 16 Tray Aerojet: 40 gallon 24 Tray Aerojet: 2-40 gallon AEROJET™ SIZES/CONFIGURATIONS TRAY SIZE 8” x 42” INLINE 2 TRAY 32” x 44” 4 TRAY 54” x 44” 6 TRAY 82” x 44” 8 TRAY 105” x 44” 12 TRAY 154” x 48” SIDE X SIDE 12 TRAY 82” x 108” minimum** 16 TRAY 106” x 108” minimum** 24 TRAY 154” x 108” minimum** **Side x side width dimensions are variable based on requested center aisle width. AEROJET™ SIZES/CONFIGURATIONS 2’ X 4’ 1 TRAY 35” x 44” 2’ X 4’ 2 TRAY 62” x 44” 2’ X 4’ 3 TRAY 84” x 44” 2’ X 4’ 4 TRAY 106” x 44” 3’ X 3’ 1 TRAY 42” x 38” 4’ X 4’ 1 TRAY 52” x 50” Expansion Modules: Expansion modules bolt right onto the bench and snap-lock into the manifolds of an existing Aerojet system. They do not include the reservoir or pump contained in the existing system. This entry was posted on September 11, 2012 at 10:40 pm and is filed under Aeroponics. You can follow any responses to this entry through the RSS 2.0 feed.